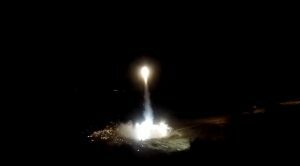 Last night, we launched our Stratos III rocket attempting to break the European altitude record. The procedures took all night and finally around 3:30 in the morning the rocket lifted off successfully. Then, 20 seconds into the flight the rocket disintegrated. The pieces landed in the ocean within the safety zone. Together with INTA (Instituto Nacional de Técnica Aeroespacial), the operator of the launch base, we’re now investigating the anomaly and the cause of the failure. We decided to take the live stream off to give our team some peace and quiet to figure out what to do next. We now uploaded the video footage of the launch to our YouTube channel. After the rocket failure, we immediately started the safety procedures and examined the flight data. We’ve been very busy handling the situation which is the reason why we went silent on social media. Now, the official statement has been released and we gathered enough information to explain the anomaly to some extent. We will try to answer all your questions but keep in mind that we are still in the process of the investigation. We would like to thank everyone who supported us and watched the live stream last night. It means a lot to us to have such dedicated fans of our project. Thank you for all the nice tweets and comments, thank you for believing in us! In the end, we’re doing rocket science which is highly unpredictable and insanely difficult. We already succeeded many times, but we also failed before too. Every step-back is actually a step forward as we learn from our mistakes and keep on working. This time we didn’t reach our goal but we’re sure we will soon get back on our feet and build the next, improved Stratos. I looked at the launch lastnight and I thought it looked very professional. I was disappointed, but as you say, it remains rocket science. the next time he flies to Jupiter. Thanks a lot for your kind response! The next rocket is definitely gonna go higher! countdown as broadcasted in the live-stream. who think by nature they are able to fix anything and those being responsible for the result and safety. Be prowed on what you have achieved as a team; most important I guess was your long journey towards this event in what you explored your theories and new ideas. That knowledge has not been lost. Thanks you! Indeed, everyone learned a lot during the 2 year long journey of Stratos III. We are happy to hear you enjoyed the live-stream! As I’m on holyday on a place with bad internet Connexxion I could follow the launch till 13:00 h.
It is a pity that the launch did not go as expected/hoped. Nevertheless I’m sure you all have learned new things to make the next launch of the Stratos IV(?) a succes. Next time you can count on MERSEN again for the graphite engine nozzle. This morning it was sad to learn on http://www.bright.nl that the rocket failed a few seconds after the launch. I followed with intervals the prepartions, the replacement of the ECU, the filling and the release of too much fuel and the heating. The first thing I was thinking of was the space shuttle several years ago. It also failed and took the life of the crew. Then I was proud on every men/women who had done their utmost to build the Stratos III and made a dream come true. I want to thank all of you for this interesting/excited day. I even burnt a candle for a happy ending. It did not work, but a hope that failure for you is not an option. I hope you will come back in the next years with a new design and that you reach your goal. You all deserve it! I wish you strenght, luck, wisdom and the skills to make your dreams come true. This morning it was sad to learn on http://www.bright.nl that the rocket failed a few seconds after the launch. I was thinking of was the space shuttle several years ago. It also failed and took the life of the crew, but this took your dream. I am proud on every men/women who had done its utmost to build the Stratos III and made a dream come true. I want to thank all of you for this interesting/excited day. I even burnt a candle for a happy ending. It did not work, but I hope that failure for you is not an option. The first thing I was thinking of was the space shuttle several years ago. It also failed and took the life of the crew, but this took your dream. Ciao guys! When I met you in gilze-rijen I was really impressed by the extraordinary passion you put in what you were doing . Believe or not, I have been inspired by your enthusiastic attitude and I really admired all your efforts and synergy . Do not give up and never stop to DARE! I wish you all the best and I look forward to your next project! From your Italian Air Force fan! As the grandmother of one of the Dare participants I followed the procedures a long time into the night, completely amazed at the complexity of it all, and at the time and hard work which went into the project. Totally share your disappointment but look forward to the next Stratos. Failure is a station on the way to succes. Learning from failure is the really great thing. Would you don’t mind, May I know what are things that cause the failure? After completion of your present research. All the best for the next trail.